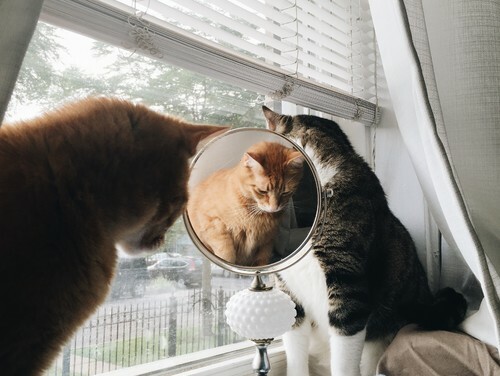 Andy and Ollie may have different personalities, but both appreciate the DIY project their mom completed for them. 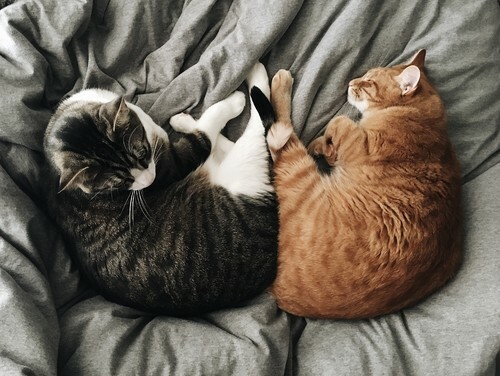 Meet Ollie: He’s the tabby cat on the left, and known as the timid one of the duo. “He’s big on hiding and napping when there’s a lot going on,” Harmon says. He also scares easily, so he rarely ventures outside. He’s much happier burrowed under the blankets on Harmon’s bed. 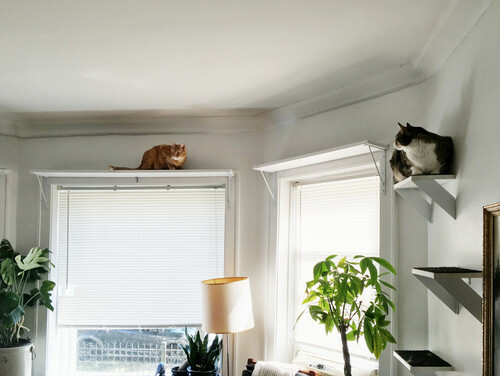 DIY cat furnishings: Harmon read that cats like to explore vertically, so she added cat shelves around her apartment living room. She spent a day sketching a design and measuring the space and decided to add shelves above the windows and smaller steps on the wall. Then she went off to the home improvement store, had the wood cut to size, painted the pieces white and attached them to the wall with brackets. For traction, she added carpet to the tops of the shelves. 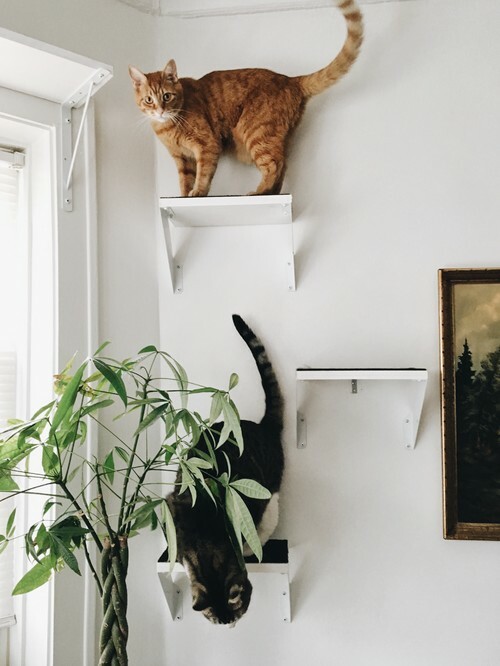 Climbing time: The staggered wall shelves give Andy and Ollie easy access to the longer, higher shelves above the windows. Curiosity killed the plants: The cats may look uninterested in the potted plants now, but as youngsters they thoroughly enjoyed digging in them and knocking them to the floor. “I was always trying to find higher ground for the plants but the cats were determined to destroy,” Harmon says. Now the two are pretty good, but Harmon has learned to put the plants up higher or to give the cats a distraction, such as the shelves. 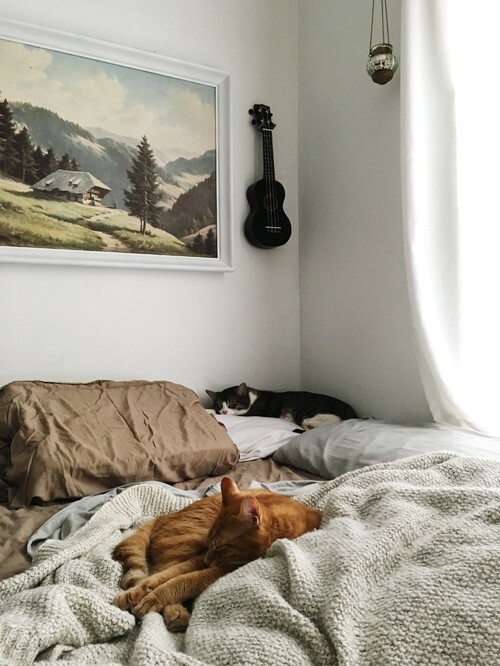 Lazy days: These two spend much of their day napping around the house. “For them, no spot is un-nappable, but in the sun by the window is prime real estate,” Harmon says. Their favorite spots include the couch, the chair by the front door and her bed. Soak up the sun: When they aren’t asleep, Andy and Ollie like to watch the neighborhood. Harmon leaves the window sills open for the cats, which doesn’t help with growing plants. “Cats win over plants any day,” she says. 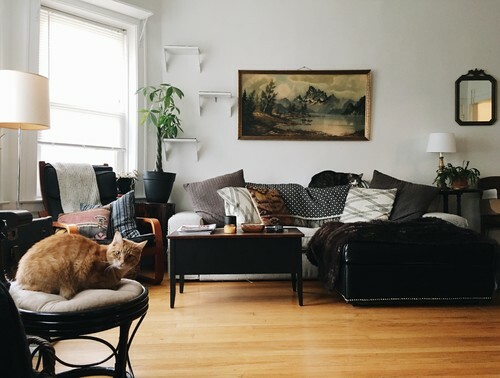 Learn more: Is cat health insurance worth it? 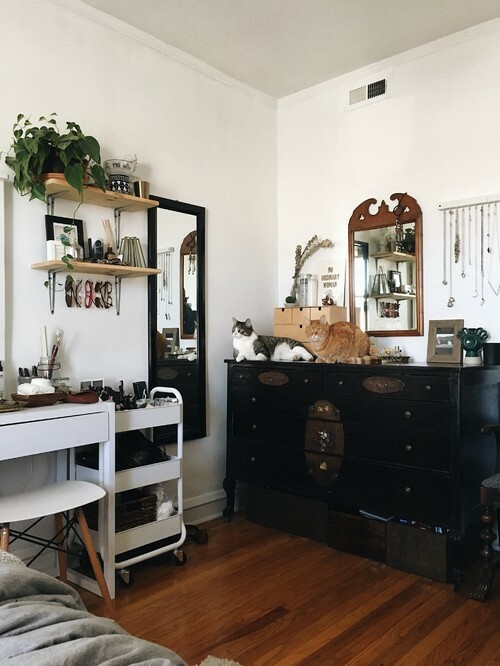 This article is part of a collaboration between Houzz and Pets Best, a U.S. pet health insurance agency founded in 2005. To learn more visit PetsBest.com.